In August 2007, the FDA issued a labeling change for warfarin emphasizing the “opportunity for healthcare providers to use genetic tests to improve their initial estimate“ of warfarin dosing. This is the first FDA recommendation to consider genetic testing when initiating a commonly prescribed medication and may set a precedent for the future use of genetic technologies in clinical practice. We conducted a systematic review of the efficacy of genetic testing to reduce significant bleeding or thromboembolic events when initiating warfarin therapy. We searched PUBMED, EMBASE, International Pharmaceutical Abstracts, and www.clinicaltrials.gov to identify published and ongoing clinical trials in the English‐language literature. Selection criteria included: randomized clinical trial comparing pharmacogenetic dosing (PGD) of warfarin using common genetic variants of CYP2C9 and/or VKORC1 versus a standard‐dosing algorithm in adult warfarin naive patients. Outcomes included percentage of patients with out‐of‐range international normalized ratio (INR) and adverse events. Two investigators independently abstracted data and assessed study quality using a validated instrument. The principal measure of association was risk difference in adverse events between intervention arms. Only 3 of 933 studies met the inclusion and exclusion criteria (423 patients). Five additional randomized trials are currently accruing patients. The 3 selected studies differed substantially in their quality, interventions and outcome measures (see Table 1). Two studies evaluated the contribution of CYP2C9 variants; one assessed both CYP2C9 and VKORC1 variants. Dosing algorithms for the control arm varied significantly. As suggested by previous observational studies, PGD improved prediction of the final warfarin maintenance dose. However, only 1 study showed that PGD improvement in clinically relevant end points such as percentage of time INR in‐range and time to first therapeutic INR. There was a trend toward fewer adverse events with PGD, but the risk difference decreased as study quality increased (see Fig. 1). Figure 1. 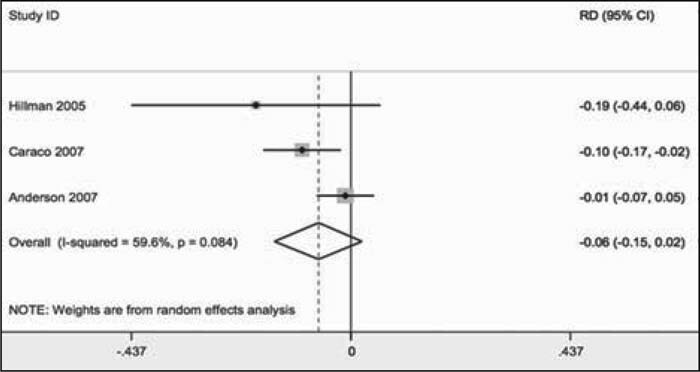 Meta‐analysis of adverse events by treatment group. Our findings suggest that using genetic testing to select initial warfarin dose may result in decreased risk of adverse events. However, small sample sizes and variation in study design prevented definitive estimates of the effectiveness, much less the cost effectiveness of this intervention. We recommend that clinicians await the results of the larger, high‐quality randomized trials before adopting genetic testing as the standard of care for warfarin initiation. K. Kangelaris, none; J. Tice, none; S. Bent, none; R. Nussbaum, none. Kangelaris K, Bent S, Nussbaum R, Tice J. Efficacy of Genotype‐Guided Warfarin Prescribing: A Systematic Review. Abstract published at Hospital Medicine 2008, April 3-5, San Diego, Calif. Abstract 36. Journal of Hospital Medicine. 2008; 3 (suppl 1). https://www.shmabstracts.com/abstract/efficacy-of-genotypeguided-warfarin-prescribing-a-systematic-review/. Accessed April 26, 2019.